Achieving Water-Energy-Food Nexus Sustainability: a Science and Data Need or a Need for Integrated Public Policy? Food is the essential foundation for sustainable and healthy communities. Increasing population and urbanization, limited resources, and complexities of interactions necessitate a comprehensive and in-depth understanding of the dynamics of the global trend of urbanization. The key objective of this paper is to generate new environmental, social and economic perspectives and practices that are responsive to the rapidly urbanizing agricultural food system. We used the sustainability paradigm in the context of environmental, social, and economic sustainability to outline the three transitioning states and perspectives (unconnected/silos; interconnected/linkages; and interdependent/nested/systems) for urban agricultural food systems. We sought to ferret out the key driver/response variables and their cross-scale interactions in the urbanizing food-energy-water nexus. We used a five-step qualitative analytical method to develop a conceptual model to capture the interacting variables and their responses. The complexity in the driver/response variables and their cross-scale interactions were identified. Then three hypothetical scenarios were used to represent complexity modeling: least, medium and most complex. These variables were combined with outside dimensions (e.g., innovation, stakeholders, urbanization) for selected scenarios and deconstructed using spider web and causal loop models. The urbanizing socio-ecological systems, across various spatial (local to global) and temporal scales (days to millennium) as well as smaller temporal scales (days to decades) are described. The iterative multidimensionality of the model makes clear new ways of seeing social issues and opens opportunities for policy solutions, resources and stakeholders to be brought to bear on the issues. The worldwide trend of urbanization, characterized and shaped by socioeconomic behaviors is rapidly evolving and transitioning the urban space that is predicted to encompass 66% of the global population by 2050 compared to the present 54% (UNDESA, 2012; Dupont Advisory Committee, 2016; Richards et al., 2016). This trend is most evident in emerging markets of Africa, Asia and Latin America and presents myriad challenges and opportunities to address food and nutrition security impacted by changes in lifestyles and consumption patterns; income and population growth; and the fast-paced diversification of diets in developing countries (Richards et al., 2016). In order to feed these larger, more urban and economically diverse populations, food production must increase by 70%. The current consensus is that the world will likely exceed 9 billion people by 2050 and is unlikely to stabilize in the 21st century (Gerland et al., 2014), requiring 70–100% more food production (Tscharntke et al., 2012). Even the most optimistic scenarios require at least a 50% increase in food production (Horlings and Marsden, 2011). The availability of freshwater resources for the required production shows a similar picture. An increasing number of countries are reaching alarming levels of water scarcity creating social, economic and environmental opportunities to increase water use efficiency, quantity, quality, availability as well as adaptive characteristics (Reardon et al.,, 2016; Richards et al., 2016). Another emerging challenge with urbanization is the rising energy prices and the use of agricultural feedstock for biofuels, causing additional scarcity on markets for food and feed (Conforti, 2009). Twelve percent of the world's urban population currently resides in megacities with population of more than 10 million inhabitants. By 2030 China and India will host seven and Africa will host six megacities (Dupont Advisory Committee, 2016; Reardon et al., 2016; Richards et al., 2016) urban and regional planning The notion that food production is an exclusively rural activity is negligent of the significance of urban agriculture, a continuous and ongoing activity in the cities and towns of the Global South. In the Global North food production is in the process of re-institutionalizing itself where urban planners, social entrepreneurs and technology innovators are re-imagining “the city as a farm” (Howard, 1898, 1902; Brown and Carter, 2003; Lyson, 2004; Morgan, 2009; Ikerd, 2017). The urban socio-ecological system that is being driven by multiscale and multilevel factors and trends is actively responding to/engaging the self-organizing, transformative and resilient properties of food and nutrition systems (Magigi, 2013; Majowicz et al., 2016; Smit, 2016; Ikerd, 2017). The primary socioeconomic driver/response factors concurrent with increasing food-energy-water demands are population growth, rising incomes and urbanization (Patel, 2007; Conforti, 2009; McMichael, 2009; Holt-Giménez and Shattuck, 2011; Reardon et al., 2016; Richards et al., 2016). Additional factors include systems integration, urban and regional planning and design and technological innovations, social entrepreneurship, issues of access, environmental change, and low-wealth populations (Ernst and Young, 2015; Reardon et al., 2016; Richards et al., 2016). Potential factor and trend outcomes of sustainably engaging food-energy-water nexus and nutrition systems include environmental, social and economic impacts. Environmental impacts include reducing urban heat island effects; mitigating stormwater impacts; lowering energy use by reducing the need for food transport; reducing urban waste streams through composting of urban organic waste (Allen and Wilson, 2012; AboElata, 2017). Social impacts include public policy, promoting paradigm shifts in environmental consciousness and awareness, reducing environmental health disparities, formation of local and regional food movements as well as food policy councils (Sumner et al., 2010; Majowicz et al., 2016). Economic impacts include access to affordable, healthy and nutritious foods, clean and safe water and access to renewable energy sources (Pothukuchi et al., 2007; Waffle et al., 2017). Food hubs and incubators provide living wage jobs for community development and resilience (Reardon et al., 2016; Richards et al., 2016; Juncos A. E., 2017). 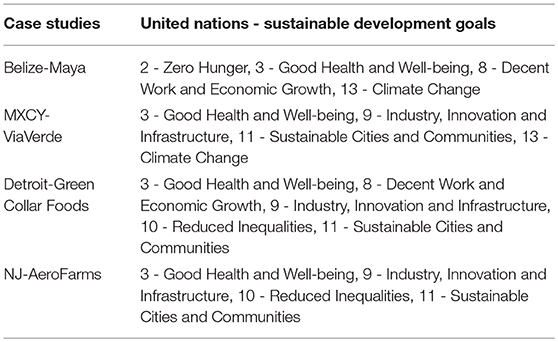 According to Kahn's elaboration of Agenda 21 (Basiago, 1999), the paradigm of sustainable development rests on the three conceptual pillars of economic, social and environmental sustainability. “Only by ‘integrating' and ‘interlinking' economic, social and environmental ‘sustainability' can negative synergies be arrested, positive synergies fostered and real development encouraged. Economic, social, and environmental sustainability form elements of a dynamic system (McClintock, 2010). They cannot be pursued in isolation for ‘sustainable development' to flourish” (Basiago, 1999). We observe that in the context of environmental, social, and economic sustainability, urban food and nutrition systems are simultaneously transitioning between states and perspectives of unconnected/silos (Figure 1A); interconnected/linkages (Figure 1B); and interdependent/nested/systems (Figure 1C), (Hembd, 2014). Essentially urban space or the built environment is evolving to fully mimic and integrate the natural system in action (McClintock, 2010; Kenyeres, 2017). Figure 1. 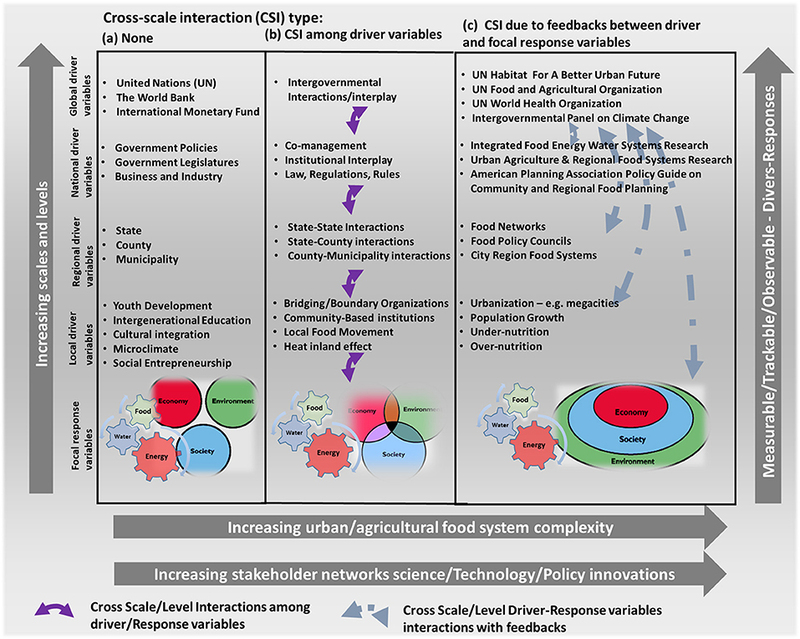 Transitioning between states and perspectives for urban food and nutrition systems in the context of environmental, social, and economic sustainability, (A) unconnected/silos; (B) interconnected/linkages; (C) interdependent/nested/systems (Hembd, 2014). The purpose of this paper is to conceptualize the rapidly transitioning and evolving urban agricultural food and nutrition system (Figure 8). The model will generate new environmental, social, and economic perspectives and practices that are responsive to the rapidly urbanizing agricultural food system. This in turn will enhance our understanding of the dynamics of the key driver/response variables in the food-energy-water nexus under the sustainability paradigm. We followed the following steps to develop a conceptual model for the urbanizing food-energy-water nexus based on the economic, social and environmental sustainability paradigm (Figures 1A–C). Step 1: Schematic of methodology followed in the study and review existing conceptual models from literature and what's trending agriculturally (Figures 2, 3, respectively). Step 2: Develop spider web diagrams (Figure 4). Spider web diagrams show the scale and level interactions of multiscale and multilevel factors and trends due to feedbacks between driver and response variables in the context of unconnected; interconnected; and interdependent nested sustainability scenarios. Step 3: Develop causal chain and loops diagram (Figure 5). Causal chain is a finite ordered sequence of actual events in which any one event in the chain causes the next (Menzies, 2017). Causal loop is when an event in the chain causes an earlier event in the chain then the loop developed is referred to as causal loop (Bures, 2017). Describing the causal chain from driving forces to impacts and response is a complex task, and needs to be broken down into sub-tasks (Kristensen, 2004). These diagrams explain the cause and effect behavior from the systems (e.g., ecosystems) standpoint to assess the impacts of climate change on multiple ecosystems. Step 4: Develop interactions across spatial, organizational, and temporal scales (Cash et al., 2006). This schematic diagram (Figures 6, 7) can be used to illustrate the dimensions of socioecological phenomena and the interaction of two human domains: microclimate research and regional energy/water management. Step 5: Integrate steps 1–4 and develop, explain and discuss the conceptual model (Figure 8). The FEW nexus refers to intersections among food, energy, and water systems that have large impacts on natural resources (e.g., water, energy), on pollution and greenhouse gas emissions (GHG), and on the security of FEW supplies (availability, affordability, quality) essential to the well-being of the world's population (Ramaswami et al., 2017). Our model is housed in the sustainability paradigm. Step 6: Embed case studies with the proposed model (Figure 2). Figure 2. Schematic of methodology followed in the study. Figure 3. Schematic that depicts the flow and connectivity between review of existing conceptual models from literature, what's trending agriculturally and those developed in this study (spider, causal chain/loop, spatial/temporal scale diagrams) that were used in developing the conceptual model. Methodology followed in the study (Figure 2) is elaborated here. Figure 4. Trade-offs among example environmental outcomes (GHG emissions), social welfare outcomes (income), food security outcomes and population growth for a given food system that have (A) no cross-scale interactions occurring between driver variables from broader to finer scales and levels with minimal multidimensional effects; (B) driver variables interactions across scales and levels; (C) cross-scale interaction due to feedbacks between driver and response variables. This figure is adapted from Ericksen (2008). Figure 5. Example causal loop shows the complexity in the columns as well as combining it with outside dimensions for the three scenarios. Examines three causal chain and loop scenarios. (A) The output is the microclimate temperature changes affect the food system and impact crop yield and food production; (B) The output is the integrated socio-ecological food-energy-water system; (C) The response from the FEWS affects the causal chains through feedback or causal loops. In the figure, acronyms En, S and Ec represent environment, society and economy, respectively. Figure 6. The Transitioning Urban Socio-Ecological Nexus across spatial and temporal scales and levels under the primary driver of urbanization. This schematic diagram can be used to illustrate the integrated spatial and temporal transitions from unconnected to an interdependent/nested urban food-energy-water nexus in the contexts of urbanization and the associated social, economic and environmental complexities and innovations. Figure 7. 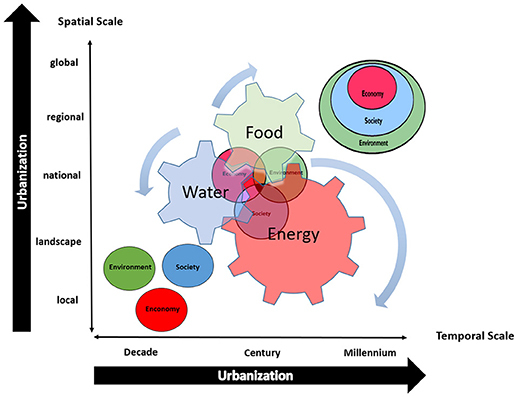 Schematic example of urbanizing food-energy-water nexus factors and trends across spatial, organizational, and temporal scales and levels. This schematic diagram can be used to illustrate the spatial and temporal dimensions of socio ecological phenomena (the microclimate-related system represented as a solid line) and the interaction of two human domains: microclimate research (hashed line) and regional energy/water management (hash-dotted lines). These figures are adapted from Cash et al. (2006). Figure 8. Urbanizing food-energy-water nexus conceptual model. The adaptive capacity and resiliency of the agriculture and nutrition system along with its associated sectors in the food-water-energy nexus to ensure food and nutritional security for a growing global population is closely tied to improved stewardship of the transitioning urban-ecological system (Reardon et al., 2016; Richards et al., 2016). Major multilevel and multiscale reforms and investments are needed in city-region systems due to the increasing scarcity and degradation of land, water and biodiversity with the added pressures of rising incomes, climate change, and energy demands especially in developing countries (Conforti, 2009; Reardon et al., 2016; Richards et al., 2016). When we acknowledge food as the foundation for healthy and viable communities then we must consider and explore its broader social, economic and environmental impacts, connections and pathways (Reardon et al., 2016; Richards et al., 2016). Urban agriculture is an evolving and complex activity “located within (intra-urban) and/or on the fringe (peri-urban) of a city or metropolitan region, which grows, raises, processes and distributes a diversity of food and non-food products, (re-)using largely human and material resources, products and services found in and around that urban area, and in turn supplying human and material resources, products and services largely to that urban area” (Mougeot, 2005, 2006; Dubbeling, 2013). These interactions are governed by multiscale/multilevel driver/response variables: dynamic, interactive, and spatial, temporal, jurisdictional, institutional, management, stakeholder network and knowledge (Grimm et al., 2000; Mougeot, 2005; Cash et al., 2006; Dubbeling and Merzthal, 2006; Golden, 2013; Koopmans et al., 2017). One of the most encouraging trends is that the evolution and transition of the integrated urban agriculture food and nutrition system is rooted in community based action organizations and initiatives responsive to various socioeconomic drivers and impacts: i.e., urbanization; under-/over-nutrition; environmental justice; climate justice; health disparities; income and employment; and food-access especially amongst minority and low-wealth populations (Gragg et al., 1997, 2002; Sobal et al., 1998; Gee and Payne-Sturges, 2004; Hicken et al., 2011; White and Hamm, 2014; Posts and Campbell, 2017). Furthermore, these urban agricultural food system drivers are fostering collaborative, functional and transformative responses in the contexts of institutional interplay; co-management, boundary or bridging organizations and social entrepreneurship amongst stakeholders at various socioeconomic and intra-urban and peri-urban scales and levels (Lee et al., 2006; Sekovski et al., 2012; Gragg et al., 2015; Jessee et al., 2015). Results include but are not limited to: food-networks (Arndt et al., 2009; Allen, 2010; Koopmans et al., 2017); community-food gardens and farms (Lovell, 2010; Hirsch et al., 2016); urban agriculture and food systems planning; local, regional, national and global food systems; food-policy councils; treating the city as if it were an ecosystem in the urban planning and design process; “bioreactor-based, distributed manufacturing systems to close the urban, water, food, waste and energy loops, that fit seamlessly into the urban environment” (Coelho and Ruth, 2006; Ericksen, 2008; Padoch et al., 2008; Sterman, 2011; Armendáriz et al., 2016); rooftop gardening; indoor vertical commercial farming; food systems architecture; design; and tech innovation with many opportunities for enhancing food and nutritional security—and increasing productivity and down-stream, value-chain entrepreneurial opportunities—particularly with more efficient use of technology the interconnectivity of the cloud, ubiquitous cell phone coverage, uberization of goods and service—from mechanization, to urban cloud-kitchens to customer delivery (Lovell, 2010; Knizhnik, 2012; Fung and Jim, 2017) for the evolving integrated urban regional food and nutrition system (Alberti et al., 2003; Lovell, 2010; Dubbeling, 2013; Hirsch et al., 2016). There are existing frameworks that utilize various multiscale and multilevel factors, trends and outcomes in urban social–ecological–technological systems. In these frameworks, factors such as disturbance have been observed as crucial drivers to different elements of these systems at different interactive scales and levels. It has long been recognized that disturbance as a concept applies to the coupled human and natural systems of urban environments (Peters et al., 2011; Grimm et al., 2017). The observed social and technological drivers and responders can contribute additional insights to disturbance research beyond urban systems. These integrated frameworks facilitate quantitative comparisons of disturbance effects on different types of ecosystems (Peters et al., 2011). Ramaswami et al. (2017), developed a generalizable systems framework and cross disciplinary approach in the analysis of the food-energy-water nexus from an urban ecosystems perspective. They also quantified multiple environmental impacts of community-wide FEW provisioning to cities, and visualized FEW supply-chain risks posed to cities by the environment using the supply-chain informed coupled water-, energy- and GHG footprints. To explain the conceptual model within a sustainability paradigm of the rapidly transitioning and evolving integrated urban agricultural food and nutrition (food-energy-water nexus) system, scale diagrams (spider and causal chains) are used as a way of showing complexity in the columns. Spider web diagrams provide a visual way of showing the three ways of sustainability paradigms with several trade-off criteria sets. The urban food and nutrition system paradigm is rooted in Basiago's examination and advocacy of imaginative policies that any society must foster if it is to achieve “urban sustainability” (Basiago, 1999). As it pertains to urban agriculture, sustainability describes food and nutrition systems that are “capable of maintaining their productivity and usefulness to society indefinitely. Such systems must be resource-conserving, socially supportive, commercially competitive, and environmentally sound” (Gold, 2007; McClintock, 2010; Majowicz et al., 2016). “As consumer diets change in more urban environments, the double burden of undernutrition and overnutrition continues to place a significant human and economic toll on cities in both developing and developed countries” (Dupont Advisory Committee, 2016). The co-evolution and integration of urbanization, urban design, urban and regional planning and agricultural food systems call for an understanding of these intersectionalities in the context of community-based participatory action, shared governance, information, innovation, human health and wellbeing, and a sustainable food energy water system (Grimm et al., 2000; Mougeot, 2006; Cassidy and Patterson, 2008; Allen and Wilson, 2012; Allen and Prosperi, 2016; Armendáriz et al., 2016; Koopmans et al., 2017). 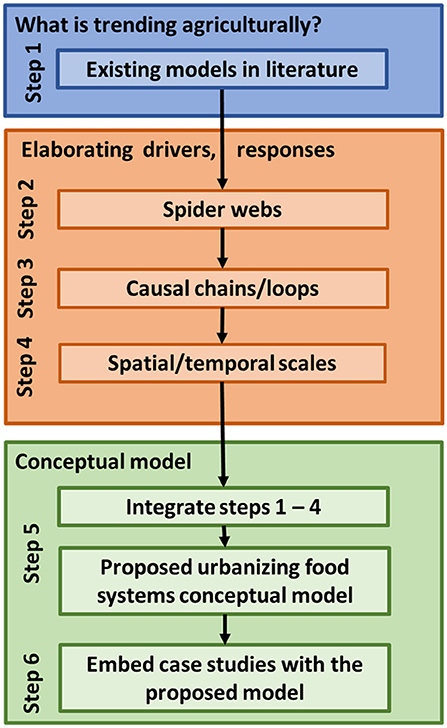 In Figures 4A–C, the potential tradeoffs among eight different food system outcomes are shown in spider diagrams and are compared among three different hypothetical scenarios to inform the conceptual model. The scenario in Figure 4A exhibits the least complexity because of no cross-scale interactions between drivers. The unconnected silos of the food, water and energy system, production of food, sanitation and human health is least supported, resulting in least agricultural incomes and utilization of social values. This leads to high food prices resulting in least affordability and low nutrition. Greenhouse gas emissions from agriculture and transporting food are highest (Musy et al., 2017). The second scenario (Figure 4B) shows medium complexity because of cross-scale interactions between drivers and interconnectedness among the systems of food, water and energy. Food production, sanitation and human health are midway supported, resulting in medium agricultural incomes and utilization of social values. This leads to medium food prices resulting in midway affordability and nutrition. Greenhouse gas emissions from agriculture and food transportation are also medium (Satterthwaite et al., 2010). 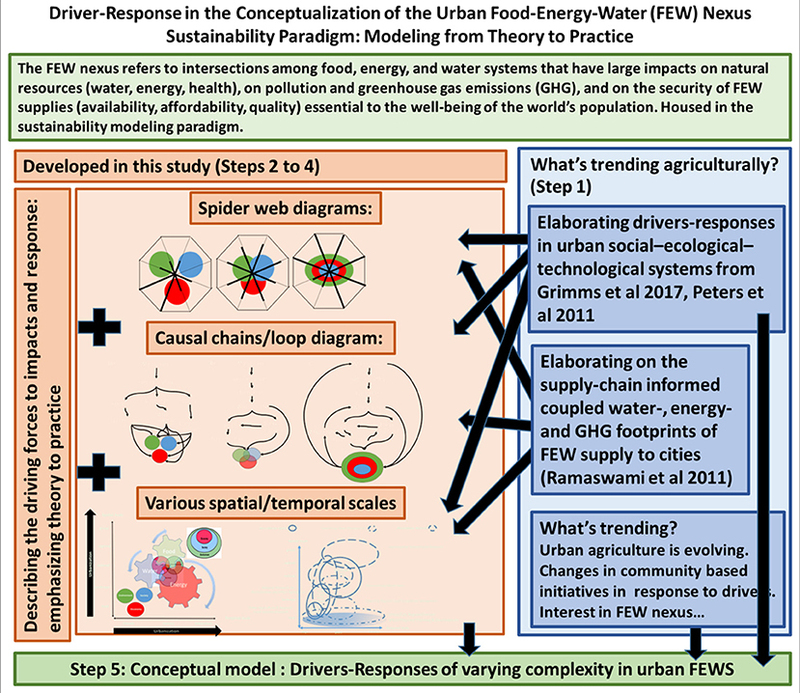 The third scenario (Figure 4C) is the most complex because of cross-scale interactions between drivers and interdependent/nested systems of food, energy, and water nexus. Food production, sanitation and human health are most supported, resulting in highest agricultural incomes and utilization of social values. This leads to lowest food prices resulting in highest affordability and nutrition. Greenhouse gas emissions from agriculture and transporting food are also lowest (Meybeck and Gitz, 2017). The population growth is assumed to follow the urbanization trend (UNDESA, 2012; Dupont Advisory Committee, 2016). The multifunctional character of the urban socio-ecological system has profound effects on a host of other sectors—including public health, social justice, food, energy, water, land, transportation, economic development and innovation (Moragues-Faus and Morgan, 2015; Armendáriz et al., 2016; Dupont Advisory Committee, 2016); responsive to globalization, urbanization and national, regional, and local food system dynamics. Beyond its nutritional value, food can frame “multilayered challenges” in urban environments while providing an integrative foundation for diverse stakeholders to collaboratively address social, environmental and economic problems in the creation of just and sustainable cities (Dubbeling and Merzthal, 2006; Gottlieb and Joshi, 2010; Alkon and Agyeman, 2011; Koopmans et al., 2017). Community-based participatory urban food initiatives and research create jobs, stimulate innovation and entrepreneurship, reduce food expenditures, improves access to fresh and healthy food; mitigate “food deserts” and health disparities along with environmental and climate justice impacts; and promote physical activity associated with food production as well as collaboration of community and academic scholars and subject matter experts (Gragg et al., 2015; Usher, 2015; Koopmans et al., 2017). These multi-cross scale and level interactions enhance social and cultural identities and interactions further enriching local communities and their social capital. They also inform transdisciplinary, systems, and culturally responsive teaching methods and practices, research and community engagement (Gragg et al., 2015; Jessee et al., 2015). Figure 5A examines three causal chain and loop scenarios to further explain the complexity and differences of the driver response variables and their cross-scale interactions in the unconnected, connected, and nested sustainability scenarios. In Figure 5A, the output is the microclimate temperature changes affect the food system and impact crop yield and food production. Increasing temperatures causes increased evaporation of water and together with changes in heat spells affects water quantity that in turn affects the water system. The changes in water quantity as well as the need for more energy required for cooling in the microclimate impacts energy production and systems (e.g., power generation). In Figure 5B, the output is the integrated socio-ecological food-energy-water system. This scenario can be explained by taking a perspective from one system where the other two systems are users. For example, here by taking a water perspective, the food and energy systems are inputs or users of the water resource. Water is a resource which can directly/indirectly impact the FEWS by quantity, quality, availability, irrigation and energy. Similarly, food as well as energy perspectives can be used. Figure 5C has all causal chains from Figure 5B in addition, the response from the FEWS affects the causal chains. The chains run in circles known as feedback loops or causal loops. For example, the sustainability nested silos of FEW systems response can result in wastewater treatments, which in turn impacts the water quantity. The other responses can result in land management practices that impact irrigation and developing energy production from biomass (Arnfield, 2003; Dimoudi et al., 2013; Golden, 2013; Waffle et al., 2017). The urbanizing food, energy and water nexus is fostering an interdependent/nested/embedded/systems perspective and practice of the environmental, social and economic sustainability paradigm (see Figure 1C). The movement toward a sustainability paradigm has brought into focus the centrality of food in our everyday lives, and its myriad social, economic and environmental connections (Gragg et al., 2017). This paper presents a conceptualization of the urban food and nutrition system based on the theory and practices of food as the foundation for healthy and sustainable communities (Gragg et al., 2017). The framework of this proposed sustainability-in-action model is rooted in the idea that urban socio-ecological systems are self-organizing, resilient and transformative “in which patterns at higher levels emerge from localized interactions and selection processes acting at lower levels” (Coelho and Ruth, 2006). This “unified urban systems theory” provides a flexible framework responsive to issues of scale and changing social and environmental conditions over time, within which to study urban systems (Coelho and Ruth, 2006). The grand challenge is for stakeholders to understand and embrace the scale and cross scale human–environment interactions that are taking us “back to the future” way of living in harmony with the natural environment and its offerings. In Figure 6, the first scenario exemplifies the least complexity because of no cross-scale interactions between the drivers and the unconnected silos of environmental, social and economic sustainability. Here the research on the food-water-energy nexus and decision-making are at these finer spatial scales too. While on the other hand the most complex third scenario with cross-scale interactions between drivers and nested food-energy-water and systems generally occur at slower timescales. 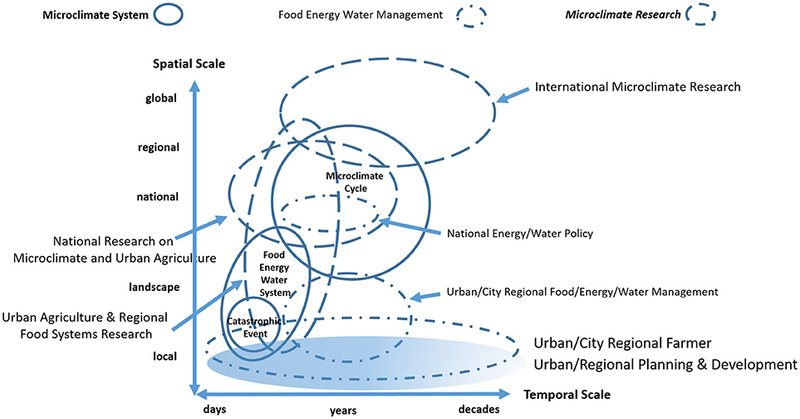 The urbanizing food energy water nexus factors and trends are discussed across various spatial and temporal scales (Figure 7). Schematic examples of interactions across spatial, organizational, and temporal scales and levels at finer time scales (days to decades) are illustrated using a spatial and temporal scale diagram (Figure 7). The interactions include socio-ecological phenomena (the microclimate-related system represented as a solid line) and the interaction of two human domains: microclimate research (the long hashed line) and regional energy/water management (hash-dotted lines). These figures are adapted from (Cash et al., 2006). In this case, gaps exist in the human systems across levels within domains, e.g., microclimate research is not interactive across international and national scales; is not linked to national energy/water policy and/or national microclimate and urban agriculture research; nor is forecasting and national food-energy-water policy linked to urban/regional planning & development across scales and levels. This diagram is based on figure by Cash et al. (2006). Our multidimensional model (Figures 8a–c), seeks to identify, characterize and deconstruct the environmental, social, and economic driver/response variables and their interactions/feedbacks for the transitioning integrated urban regional food and nutrition system that for the purpose of this food/ecological model (Sobal et al., 1998), is referred to as the “food-energy-water nexus.” The nexus is a dynamic interaction among humans, agriculture and the environment; it integrates physical (such as built infrastructure and new technologies), natural (such as biogeochemical and hydrological cycles), biological (such as agroecosystem structure and productivity), and social and behavioral entities (such as decision making and governance); (NIFA Research Addresses, 2016). “Urban agricultural food and nutrition macrosystems” are made up of biophysical, socio-ecological, and socio-cultural drivers/responses that exhibit local to global variations (Sobal et al., 1998; Heffernan et al., 2014). For simplification, the term “Urban macrosystems” is used here to include four dominant spatial “scales” (interpreted as spatial extents, but which can be interchanged with temporal extents), and the potential driver response interactions that make up the urban regional food-energy-water system are arrayed along multidimensional gradients of complexity. Unidirectional interactions from broader- to finer-scale drivers or explanatory variables (Figure 8a); bidirectional interactions between variables within a scale (arrows in Figures 8b,c) and cross-scale interactions and feedback loops are perhaps the three interaction types of most important scenarios (Heffernan et al., 2014). Variations in both temporal (e.g., daily, monthly, seasonal, and annual, decadal) and spatial (e.g., local, regional, national, and global) scales and data sources are arrayed along multidimensional gradients of scenario complexity in this multidimensional conceptual model. Initially, driver variables are grouped into appropriate scales and levels, and three scenarios of causal chains and feedback loops are identified (see Figures 8a–c). These observable, measurable and trackable driver/response variables are governed as well by various underlying multidimensional socioecological and biophysical influences and effects: scale and cross scale dynamics; stakeholder networks; macrosystem complexity; resiliency and adaptive capacity (Alberti et al., 2003; Seto and Kaufmann, 2003; Sumner et al., 2010; Neumann et al., 2015; Weiler et al., 2015; Allen and Prosperi, 2016; Armendáriz et al., 2016; Richards et al., 2016; Sharifi and Yamagata, 2016; Juncos A. E., 2017; Li et al., 2017; Stringer et al., 2018). Group one scenarios (see Figure 8a) have the least complexity and no cross-scale interactions occurring between driver variables from broader to finer scales and levels with minimal multidimensional effects. This scenario represents the disaggregated (unconnected/silos; see Figure 1A) socioecological drivers and focal response variables of the urban agricultural food system in transition initiated by local drivers (Sterman, 2011). Group two scenarios (see Figure 8b) have medium complexity, interactions, and dimensional effects; where driver variables interact across scales and levels; and more complex interactions occur; with the driver variable at different scales influencing the transition of the food-energy-water system in the urban space (Figure 8b, interactions between driver and response variables). This scenario represents the aggregation (interconnected/linkages; see Figure 1B) of the socioecological drivers and focal response variables, and their cross-scale interactions, under increasing underlying multidimensional socioecological and biophysical influences and effects (James and Friel, 2015; Passe et al., 2016). Group three scenarios (see Figure 8c) have the most complex interactions (interdependent/nested/systems; see Figure 1C) and multidimensional influences and effects; representing cross-scale interaction due to feedbacks between driver and focal response variables (Figure 6C, driver/ focal response variables interactions). The multiple dimensions outside the columns (e.g., spatial scales and levels; science, technology, and innovation; macrosystem complexity; and measurable, trackable, and observable drivers/responses) impact all three scenarios at increasing levels of influence and effects and assessment. The integration of the underlying multidimensional socioecological and biophysical influences and effects and the sustainability paradigm are distinguishing aspects and components of this conceptual model (Cash et al., 2006; Ericksen, 2008; Hazell and Wood, 2008; Sterman, 2011; Sekovski et al., 2012; Majowicz et al., 2016; Blake, 2017; Musy et al., 2017). This multidimensional conceptual model will improve our understanding and development of the key driver/response variables and interactions of the food-energy-water nexus; their sensitivities to human economic development and building social capital; resiliency and adaptive capacity; and the causal chains and feedback loops linking non-uniform changes and ecosystem functions in rapidly evolving and transitioning urban socio-ecological infrastructural systems such as urban agricultural food (Armendáriz et al., 2016; Richards et al., 2016; Ramaswami et al., 2017). Thus, the urban socio-ecological infrastructural system influenced by these cross-scale interactions and feedbacks can be observed, assessed, operationalized and integrated by stakeholders. This approach is iterative. Interactions and feedbacks can be refined and new relationships added in subsequent model iterations. These include documenting uncertainties in the interactions and feedbacks. If stakeholders observe no change in the system functions, then they can identify other human-environment indicators, processes and scenario generation methods that are dampening the relationship exhibited by the driver/response variables. The better identification of causal chains and feedbacks underlying the scale and cross-scale dynamics in the urban agricultural food system plays an important role in developing sound sustainable urban agricultural food systems (Armendáriz et al., 2016), policy and management strategies amid rapidly evolving urbanization accompanied by over- and under-nutrition (Dubbeling, 2013; Weiler et al., 2015; Dupont Advisory Committee, 2016; Majowicz et al., 2016; Schipanski et al., 2016; Smit, 2016). The following four case studies were selected because they were each unique in their social, economic, and environmental depiction of the transitioning urban agriculture and nutrition system and they are at the same time broadly representative as seen when associated with their corresponding United Nations Sustainable Development Goals (see Table 1) created in-part to meet the grand challenges and opportunities of urbanization, population growth and food security (Griggs et al., 2013). Table 1. Sustainable development goals in action. Perhaps a useful case study could be found in urbanizing, southern Belize where Maya farmers from three villages shared their experiences with yields of corn types, the effects of climate change on the growing season and milpa productivity, and on socio-cultural impacts on farming. This case study example highlights work being accomplished to improve food security. Plans for sustainable water and energy practices will be addressed in the future. In many communities across the developing world, households continue to produce most of their own food (Wilk, 1997). In these settings, improving food security depends upon increasing local agricultural productivity, while maintaining household access to productive land and avoiding environmental degradation (Rosset, 1999; Perfecto et al., 2009; Herrero et al., 2017). The Maya milpa1 study explored the drivers influencing the change in forest ecology, its effects on milpa production and practices and food security in three Mopan-Q'eqchi' Maya villages in the Toledo District of southern Belize: Santa Cruz, Aguacate and Jalacte (author's fieldnotes, March, 2018). Some of the stated objectives of the project were to study soil fertility, water quality, weed ecology, farming practices, land use change and food insecurity. Several focus groups were held with participants (farmers) from all three villages. They were asked three questions: What did they see as the drivers of forest change? What factors are affecting the changes in milpa? And, how were these changes affecting household food security2? Many of the responses highlighted the effects of climate change and weather patterns as affecting dry and wet seasons. This shortens the growing season, affects yields and promotes the invasion of grasses that reduces corn production. In addition, food security was affected by more young people in the villages “jobbing out,” or preferring to find work in the larger towns and not farming in the villages (author Usher fieldnotes, March, 2018). This case study relates to the Sustainability Paradigm and connects with the Spider Web Figures 4A–C; Causal Loop Figures 5A–C; and Spatio-Temporal scale diagrams Figures 6, 7. This example case shows the trade off in food security outcomes within the Spider Web diagram (when the environment—which is affected by climate change, the social—affected by urbanization/less farmers and economic—affected by urbanization/pre-packaged processed foods). That is, with increase impacts of urbanization and climate change, milpa yields are diminished and the communities' way of life become less sustainable. Examining the Causal Loop diagram, we understand the impact of the three villages coming together to share resources such as more adaptive seeds and planting techniques to address the impacts of climate change. Increasingly, cities around the world are enacting food and urban agricultural initiatives to increase food security among its vulnerable and marginalized populations, and stimulate local economic development. In the case of Mexico City, one of the world's mega-cities, Vertical Gardens act as air filters and reduce heat island effects in urban areas when implemented at massive urban scale. The water source is recycled and harvested rainwater is used for irrigating the gardens. The “Via Verde” (Green Way) is an innovative urban greening project where approximately 60,000 sq. m. (15 acres) of vertical gardens were installed around more than 1,000 highway pillars covering nearly 17 miles (27 km) of space. In addition to growing food, the project will improve air quality, reduce traffic noise pollution, beautify the urban landscape, and reduce heat-island effects caused by air pollution and the effects of climate change. Along with those functions, the project has created jobs, uses an automated irrigation system for efficient water usage, and improves the emotional well-being of citizens. This project is an exemplar case of the nested scenario of the Social, Environmental and Economic states in an urbanized area within the Spider Web and Causal Loop diagrams. Due to the effects of the changing climate and urbanization, microclimates develop that create heat-islands. Referring to Figure 5C, as this project incorporates the nested scenarios, it is able to respond appropriately to the issue of the microclimate with the use of vertical gardens, the efficient use of water, and by also creating jobs for the local economy and improving social welfare by improving urban aesthetics. (http://viaverde.com.mx/v2/). Once thriving mid-western cities in the United States are thinking creatively about ways to increase employment and putting abandoned property to productive use. Green City Growers, a subsidiary of Evergreen Cooperative in Cleveland, Ohio has been able to provide fresh, local food all-year round while providing employment to its worker-owners some of whom are immigrants and new Americans and returning citizens. Retrieved from https://www.clevescene.com/cleveland/worker-owned-green-city-growers-is-on-the-path-to-profits-while-giving-refugees-and-ex-cons-gainful-employment/Content?oid=5740258. Green Collar Foods (GCF) is building a franchise of small-scale, low-cost, and locally-owned controlled environmental agriculture production facilities in inner cities across the US and the UK. This social entrepreneurship model uniquely targets urban populations in the midst of multilevel and multiscale socioeconomic challenges such as food insecurity; health disparities; and low-wealth. (www.greencollarfoods.com). This project resonates with the nested sustainability paradigm in the Figure 4C Spider Web. It incorporates social, economic and environmental components to address nutrition, income from food production, food prices, food production, and it limits GHG emissions by using aeroponics technology. AeroFarms, has built the world's largest vertical garden without soil, water or sunlight. The process uses technology in what it calls “precision agriculture” to increase crop yields by as much as 70 times that of traditional farming. Growing crops this way produces no pollution from runoff and their use of L.E.D. lights reduces energy consumption significantly. (http://aerofarms.com). This example embeds with our Spider Web diagram in Figure 4C. The company has 120 employs, produces affordable food which improves food access, and GHG emissions are low due to no agricultural runoffs. In this paper we presented a conceptual model of the urbanizing food-water-energy nexus developed on the notion of “food as the foundation for sustainable and healthy communities”. This is the idea that food is not only the primary element in the formation of human settlements (Mumford, 1961; Steel, 2008), but also that food as a component of the water and energy cycle is vital for all life on our planet. Compared to other models our multidimensional sustainability paradigm iterative model is framed using a unified urban systems theory. The model is aligned with the three social, economic and environmental corners of the “Planner's Triangle” (Campbell, 2013)—in unconnected, interconnected and interdependent nested systems, with increasing complexities and constraints to model three broad food-energy-water scenarios. This model presents a simplistic scenario with no cross-scale interactions between drivers and unconnected silos of food, energy and water. Therefore the decision-making process is not integrated across spatial and temporal scales as demonstrated in the Belize case study. However, in the most complex third scenario with cross-scale interactions between drivers in nested food, energy and water systems, integrated decision-making occurs due to multiple and highly complex interactions and feedbacks. This is demonstrated in varying degrees of complexity in the Detroit, New Jersey and Mexico City case studies. This conceptual model holds saliency for public decision-makers and policy analysts, urban planners, public health professionals, as well as community and non-profit organizations concerned with food access, social and environmental justice, land use and employment, and sustainable economic development. It can serve as an educational tool to inform the connections and interactions between economic, social and environmental sustainability and the food-energy-water nexus in a urbanizing world. It makes clear new ways of seeing, learning and understanding opportunities for policy solutions, resources and stakeholders to be brought to bear on the issues. The systems thinking approach utilized in this model provides an easy way to understand the integration of components, connections and interactions in the sustainability nexus. This decreases waste, builds resiliency and adaptive capacity while improving access, sanitation, nutrition, human and animal health. Ultimately it develops smart policy around land use, land ownership, trade, and economic policy that encourages entrepreneurship and access to credit, access to markets, cooperatives, transparency in government, rule of law, and basic infrastructure (all-weather roads, reliable electricity, etc.). Future work will elaborate the Urban Agricultural Food and Nutrition System in Action, discussing the next steps in moving beyond the conceptual model using new intra- and peri-urban processes, materials and paradigms can arise from these integrated urban biomanufacturing/production systems. Further development of the model includes deploying the model in urban food system scenarios, gathering qualitative and quantitative input from urban food system and sustainability stakeholders and practitioners. The field testing of the model was not carried out in this study. The validation and field testing of the conceptual model are the next steps. Dimensions such as sociocultural settings, socioeconomics gradients can be incorporated in the current conceptual model. The other model limitations are that we are unable to identify and represent every driver variable and their interactions and feedbacks in the present or in the future. Nor can we account for the compounding effects of two or more variables. As such, the model attempts to address the grand challenge for stakeholders to understand and embrace the scale and cross-scale human–environment interactions by taking us “back to the future” way of living in harmony with the natural environment and its offerings. This material is based upon work partially supported from the USDA-NIFA's capacity-building grant 2017-38821-26405, USDA-NIFA Grant 2018-68002-27920 as well as the National Science Foundation under Grant No. 1735235 awarded as part of the National Science Foundation Research Traineeship and DUE-1125331 awarded as part of the Science, Technology, Engineering, and Mathematics Talent Expansion Program. 2. ^Food security is defined as having reliable access to a sufficient quantity of affordable, nutritious, culturally appropriate, non-emergency food at all times to maintain a healthy and active life. Alkon, A. H., and Agyeman, J. (eds.). (2011). “Introduction: the food movement as polyculture,” in Cultivating Food Justice: Race, Class, and Sustainability (Cambridge, MA: The MIT Press), 1–20. Allen, W., and Wilson, C. (2012). The Good Food Revolution : Growing Healthy Food, People, and Communities. New York, NY: Gotham Books. Blake, C. (2017). Understanding Drivers of Food Choice in Diverse and Dynamic Settings: Conceptual and Methodological Innovations. Available online at: http://ilsi.org/event/hungry-cities-the-global-revolution-in-food-systems/ (Accessed October 16, 2018). Brown, K., and Carter, A. (2003). Urban Agriculture and Community Food Security in the United States: Farming from the City Center to the Urban Fringe. Cassidy, A., and Patterson, B. (2008). The Planner's Guide to the Urban Food System. Los Angeles, CA: University of Southern California School of Policy, Planning, and Development Center for Sustainable Cities. 1–12. Conforti, P. (2009). Looking Ahead in World Food and Agriculture: Perspectives to 2050. Rome: Food and Agriculture Organization (FAO) 5–20. Dubbeling, M. (2013). CITYFOOD : Linking Cities on Urban Agriculture and Urban Food Systems Resilient Food Systems : Why Should Local and Regional Governments. Leusden, 1–12. Dubbeling, M., and Merzthal, G. (2006). Sustaining Urban Agriculture Requires the Involvement of Multiple Stakeholders. Cities Farming for the Future: Urban Agriculture for Green and Productive Cities. ed R. van Veenhuisen (Ottawa, ON: RUAF Foundation, IIR, IDRC), 19–40. Dupont Advisory Committee (2016). The Urban Transition: Implications for Global Food Security. Edgemore, DE, 17. Ernst and Young. (2015). Megatrends 2015: Making Sense of a World in Motion. The 2016 EY Global Trade Symposium report, New York, NY. Gottlieb, R., and Joshi, A. (2010). Food Justice. Cambridge, MA: The MIT Press. Gragg, R. D., Christaldi, R. A., Leong, S., and Cooper, M. (1997). The location and community demographics of targeted environmental hazardous sites in Florida. J. Land Use Environ. Law 12, 1–44. Hembd, J. (2014). The Venn (and Zen?) of Sustainable Communities: A Capital Approach. Superior, WI: Community Capitals Framework Institute. 1–36. Howard, E. (1898). To-Morrow: A Peaceful Path to Real Reform. New York, NY: Cambridge University Press. Howard, E. (1902). Garden Cities of Tomorrow: Experiments in urban planning. 2nd Edn., London: Swan Sonneneschein & Co., Ltd. Available online at: http://viaverde.com.mx/v2/?lang=en retrieved on November 20, 2017. Available online at: https://www.clevescene.com/cleveland/worker-owned-green-city-growers-is-on-the-path-to-profits-while-giving-refugees-and-ex-cons-gainful-employment/Content?oid=5740258 (Accessed November 20, 2017). Kenyeres, I. (2017). Available online at: http://www.biopolus.org (Accessed October 15, 2017). Kristensen, P. (2004). The DPSIR Framework. Aarhus: National Environmental Research Institute, Denmark, 10. Lyson, T. A. (2004). Civic Agriculture: Reconnecting Farm, Food, and Community. Hanover: University Press of New England. Mougeot, L. J. A. (2006). Growing Better Cities: Urban Agriculture for Sustainable Development. Ottawa, ON: International Development Centre. Mougeot, L. J. A. L. (Ed.). (2005). Agropolis: The Social, Political and Environmental Dimensions of Urban Agriculture. Earthscan and the International Development Research Centre (IDRC). (International D. R. C). NIFA Research Addresses. The Food–Energy–Water System (February, 2016). Passe, U., Anderson, N., and Krejci, C. (2016). Methodologies for Studying Human-Microclimate Interactions for Resilient, Smart City Decision- Making. Patel, R. (2007). Stuffed and Starved. Brooklyn: Melville House Publishing. Perfecto, I., Vandermeer, J. H., and Wright, A. L. (2009), Nature's Matrix: Linking Agriculture, Conservation and Food Sovereignty, London: Earthscan. Posts, R., and Campbell, B. N. (2017). Farming Cities : the Potential Environmental Benefits of Urban Agriculture. Reardon, T. A., Bereuter, D., and Glickman, D. (2016). Growing Food for Growing Cities: Transforming Food Systems in an Urbanizing World. The Chicago Council on Global Affairs. Rosset, P. M. (1999). The Multiple Functions and Benefits of Small Farm Agriculture in the Context of Global Trade Negotiations, Institute for Food and Development Policy,Food First Policy Brief No. 4. Steel, C. (2008). Hungry City: How Food Shapes Our Lives. Random House Group Ltd. (p. 400). Sterman, J. D. (2011). Part I: Managing the Earth's life support systems: The Emergence of Sustainability Science and Transdisciplinarity. Sustainability Science: The Emerging Paradigm and the Urban Environment. UNDESA (2012). “World Urbanization Prospects: The 2011 Revision.” Department of Economic and Social Affairs, Population Division, 318. White, S., and Hamm, M. W. (2014). Urban Agriculture and a Planning Approach to Urban Food Systems. Center Report Series, No. 4. Global Center for Food Systems Innovation, Michigan State University, East Lansing, USA, (4), 23pp. Wilk, R. R. (1997). Household Ecology: Economic Change and Domestic Life among the Kekchi Maya in Belize. DeKalb, IL: Northern Illinois University Press. Copyright © 2018 Schulterbrandt Gragg, Anandhi, Jiru and Usher. This is an open-access article distributed under the terms of the Creative Commons Attribution License (CC BY). The use, distribution or reproduction in other forums is permitted, provided the original author(s) and the copyright owner(s) are credited and that the original publication in this journal is cited, in accordance with accepted academic practice. No use, distribution or reproduction is permitted which does not comply with these terms.